Happy Friday!! I’m so excited because after today, I will be on a LONG 4 day weekend!! It’s going to be filled with a good mix of celebrating and relaxing. I can’t wait. A few weeks ago, the hubs and I made our own little 3 day weekend and headed down to Galveston, TX. It’s just about an hour south of Houston. I love living so close to a beach vacation spot. It’s perfect for weekend getaways. Today’s outfit was inspired by and shot on our trip. 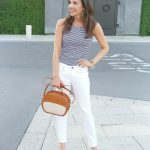 Planning outfits for a beach vacation can be easy, swimsuits and a couple sundresses, but what about what to wear on a vacation date night? 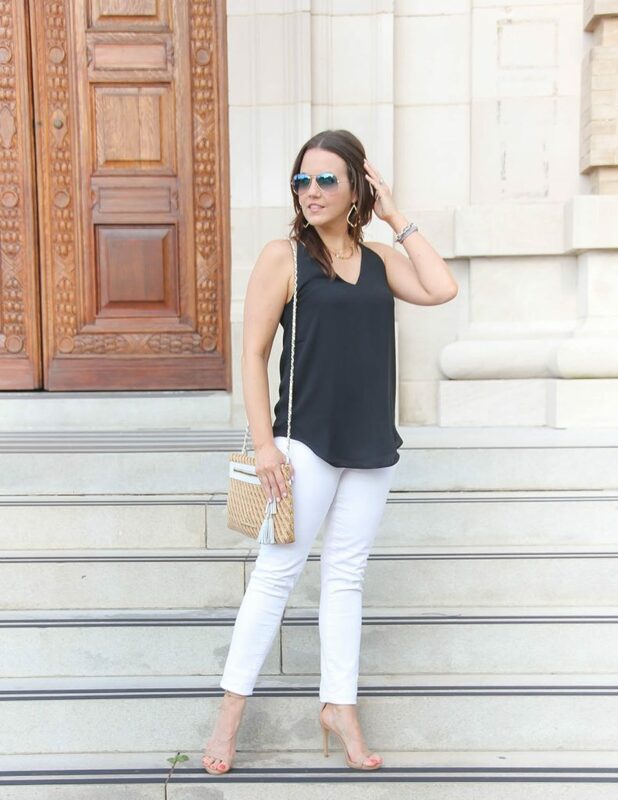 I always pack a simple cute top and my white jeans when we head down to the beach. It’s an easy ensemble that also looks nice in case you decide to eat at a no shorts, no flip flops restaurant. Classic black and white always looks a bit dressier and sophisticated chic. Toss on a few gold accessories and you are ready to go! 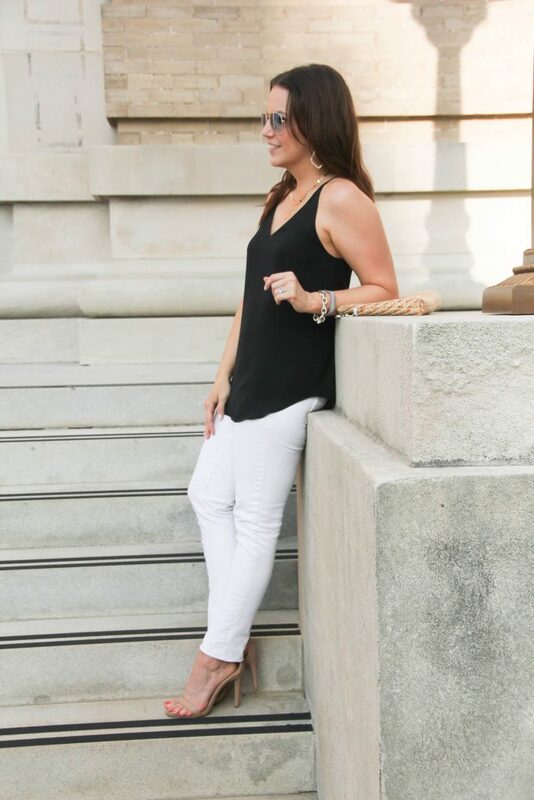 If you wanted to stay away from heels while on vacation, you could also pair this with wedge sandals or a nicer flat sandal like this one or this one. Even a basic flat with a cute little pop of leopard would work with this look. Ya’ll I’m OBSESSED with this black strappy cami. 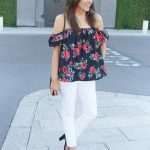 I have been searching for the perfect fitting cami for years that was also affordable. I can wear a normal strapless bra with this one and it doesn’t show, It’s not too loose so when I bend over everything is not on display, but it’s also not too tight either which is nice for overindulging or a bad sunburn. Plus, I like the length of it. I decided to go with an XS because I’m a bit smaller up top, and I find that fit my size just right. I’m so in love, I ordered the red and purple too when they were on sale this week. 🙂 PS – All 3 colors are still on sale too!! I hope you all have a fabulous and safe 4th of July weekend! Thanks so much for taking a bit of time out of your day to read this little old blog of mine. I really do appreciate it and all your sweet comments so much! 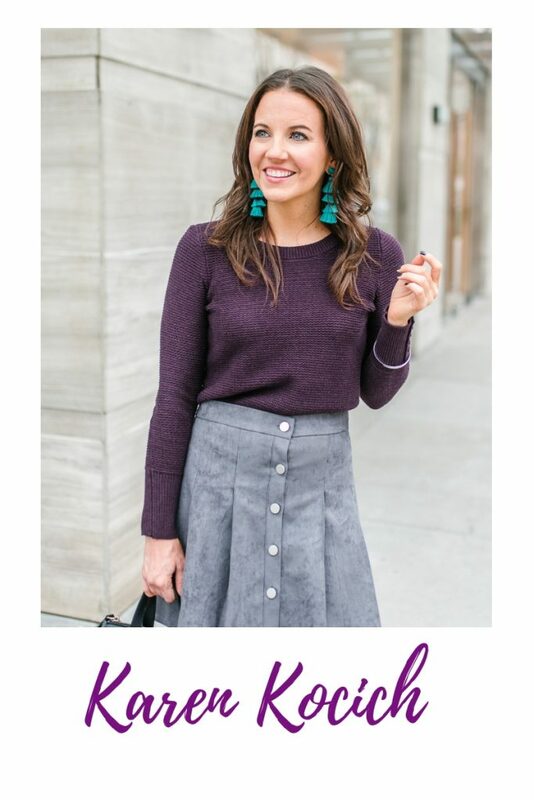 Such a great look!! Love that tank too, might have to go try one on too!! 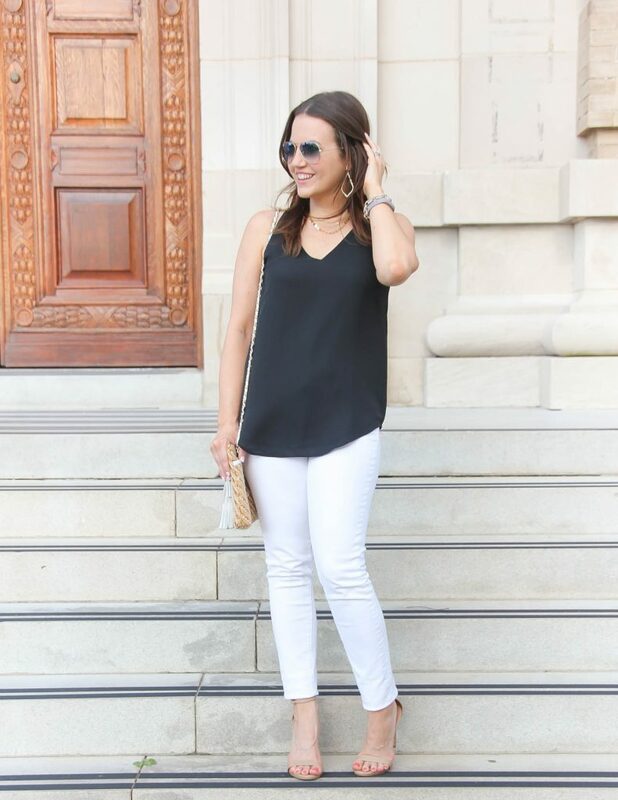 What a simple, yet chic date night outfit! I hope you had a happy Fourth of July and a relaxing 4 day weekend! I’ve been debating that cami, looks like a super fit. Hope you guys had a blast in Galveston. 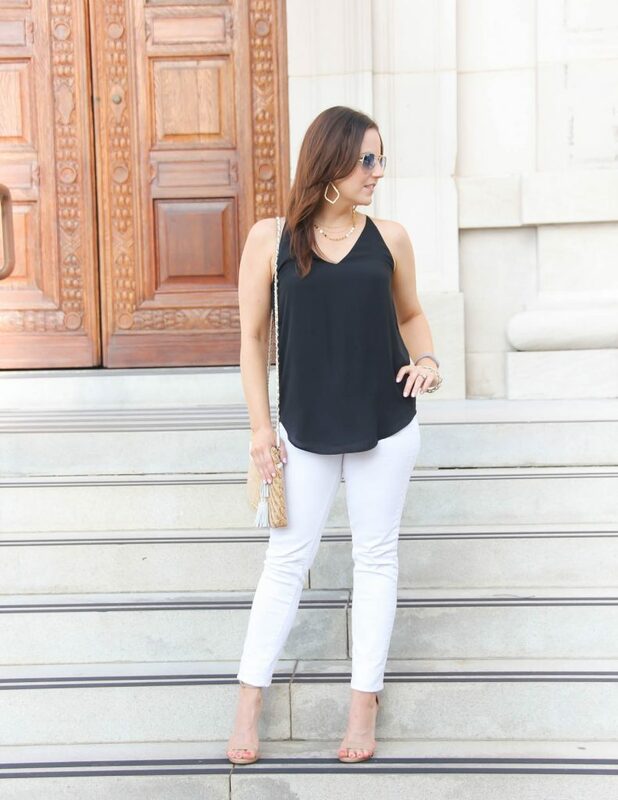 I am all about comfort on vacation, and I totally agree with the necessity of white jeans – my favorite. That cami is so cute, too. I hope you had a great weekend! This cami TOTALLY caught my eye. I’ve been looking for a good one and this one looks perfect. I will definitely check it out! Hope you enjoyed your weekend! Such a classic look. I love the delicate jewelry you’re wearing with this! I am such a sucker for black and white. Love this outfit!! I never take my white jeans to the beach! I’m too afraid they’ll get in a tangle with my sunscreen!!! 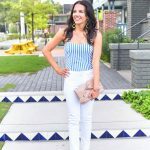 Really loving this white denim!